Stay home, Lassie! Go away Rin Tin Tin! 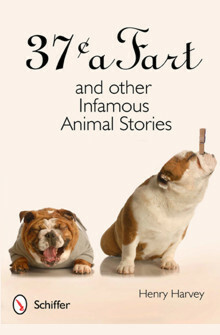 The stars of 37 Cents a Fart and Other Infamous Animal Stories aren’t heroic animals. They fart, they play you for a sucker, they hump your leg, they get sick, and sometimes they die. These 44 bittersweet stories are about REAL creatures. And no, it’s not just about cats and dogs. Snakes, guinea pigs, snapping turtles, bats, mice…they all have their stories. And in the end, when you close the book, you may even feel a bit more kindly toward mankind. Sprinkled with 60 charming illustrations, this is a warm, candid, and entertaining book for anyone who’s ever loved an animal.